In total there are 12 apartments available, all completely new and furnished in a modern way. Ideal for families or groups of friends that love nature and culture. The position of these apartments is ideal for excursions to cities such as Ferrara (50km), Ravenna (40km) and Venice (90km). But there is also plenty to see and experience in the immediate surroundings. 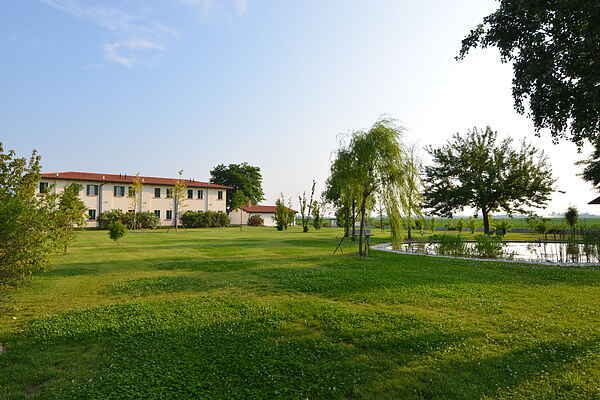 The apartments are located opposite the famous Abbazia di Pomposa and at a short distance from the Po Valley where the lovers of birdwatching, photography and nature in general can enjoy themselves. Also in the resort there is plenty to do. There is a restaurant where typical local dishes are served. It is also possible to follow cooking courses here. Or what about a relaxing day at the pool and in the wellness center with among others a jacuzzi, sauna and Turkish bath.